After the previous article ‘Can people step on the modules?’ was published, many people asked questions like ‘Can people stand on the frame?’, ‘Does the impact during the workers move the module damage the module?’, ‘Does the dropped tools result in cell cracks?’… Here I share a report from ISFH  and our internal experiment result to give you some idea what might be dangerous during installation. Can people step on the modules? Can people step on the modules? Although we have seen a lot of module damage in the field (On-siteEL is starting a quality revolution), but many people still doubt it. 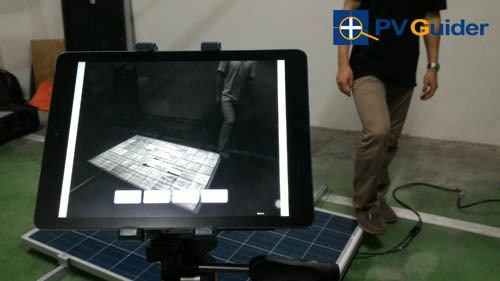 Frequently asked question is that modules can pass 5400Pa mechanical load test, which is 890 kg uniformly distributes on standard module (1.65m x 1m), why workers with weight less than 100 kg can not step on the module? Module strength mainly depends on the glass, frame, cell breakability and the interaction of all these factors. 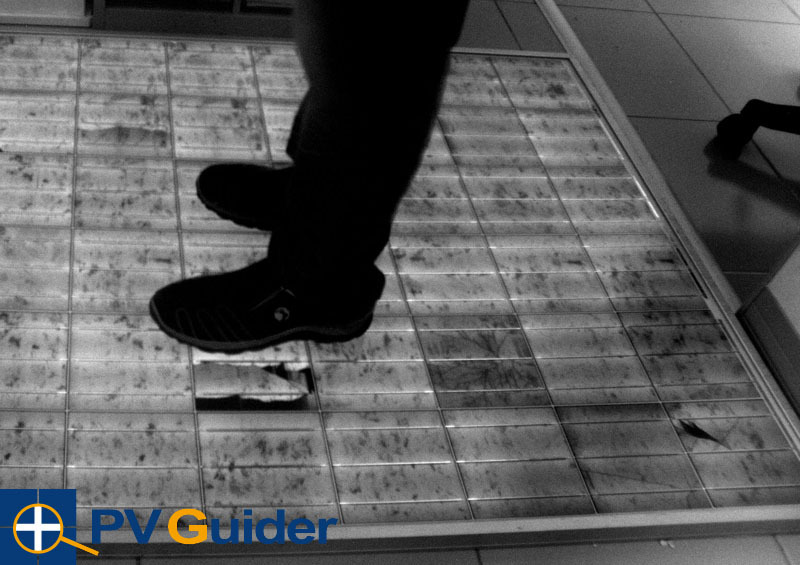 Most PV modules are certified with mechanical load test, which means they are supposed to stand the high pressure brought by storms. But why are there still damages due to storms? EL inspection is commonly used in module production lines, most buyers request 100% module EL inspection before delivery. Unfortunately the same quality request is not applied to the PV plants. 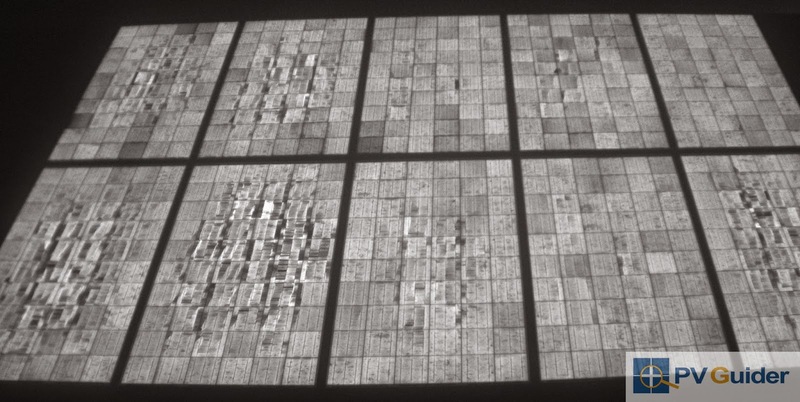 The above photo shows an EL image of a PV array, serious cell breakage is found in the middle of the modules. This kind of breakage frequently happens during installation or maintenance, but only few really check it on the PV array. EPCs request a very high quality standard for modules, but many of them do not apply the same request level to their installations. We have seen many installers and panel cleaning workers walking on the modules, and some owners even invite guests to take photos standing on the modules. Chief Consultant at PV Guider Consultancy. Started PV technology research in 2004, has expertise in PV module technology and plant quality control.